Think you wake up on your 50th birthday feeling as fresh as a teenager. This is the experience observed for iTracker, the high performance solar tracker manufactured by Soltigua, which reached 50 year equivalent operational life with plenty of working capacity still left to be exploited. The continuous uninterrupted table design makes iTracker the PV tracker with the highest power density, i.e. with the highest number of modules which can be installed for a given unit of available land. Power density is higher for long trackers, which also have a lower €/kW cost than shorter ones. Coherently, Soltigua tested on the field one of the longest version of iTracker, to prove the reliability of the benefits it offers. 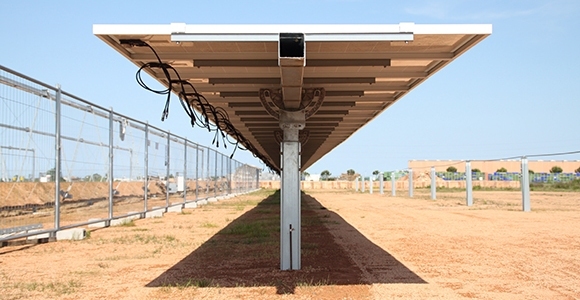 Tests included the iT90, a 90-meter-long solar tracker which can host a continuous table of 90 PV modules in portrait configuration, for a total installed capacity up to 32.4 kWp. The iT90 was monitored on the field and also remotely, thanks to Soltigua’s innovative monitoring system, which makes it possible to track down the behavior of individual trackers even in very large PV plants of several tens of MW. During testing, several load combinations were tested, artificially applying additional loads along the tracker, to challenge it also in operations at extraordinary conditions. “iTracker’s baricentric design is aimed precisely at ensuring high and reliable performance also for very long tables, such as in the case of iT90 – says Soltigua’s Technical Director Vittorio Orioli – The product is also engineered to withstand wind forces not only statically but also dynamically. As we sell systems meant to last for many years, we take reliability very seriously. This is why we are continuously running operational test on individual components and fully assembled collectors. We are very satisfied with the iT90 test results. After so many years of equivalent service life in the field the tracker presented so little wearing effects, that we decided to continue the test to check the limits of the different components”. So iTracker woke up on its 50th birthday feeling as fresh as a teenager … and is still aging as gracefully as it moves!